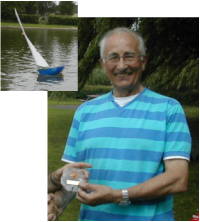 Sailing Section members of the Wicksteed Park Model Boat Club worked together clearing weed on Thursday & Friday so that the event could take place. The east wind was light and with the surrounding greenery this made for some very interesting directional changes around the lake. Peter Jackson set a simple there and back again course, twice round, tacking upwind on the start leg and downwind on the return, however the downwind leg proved the trickier of the two to get right with it switching from a very broad reach to a tack and back again once you neared the downwind gate. 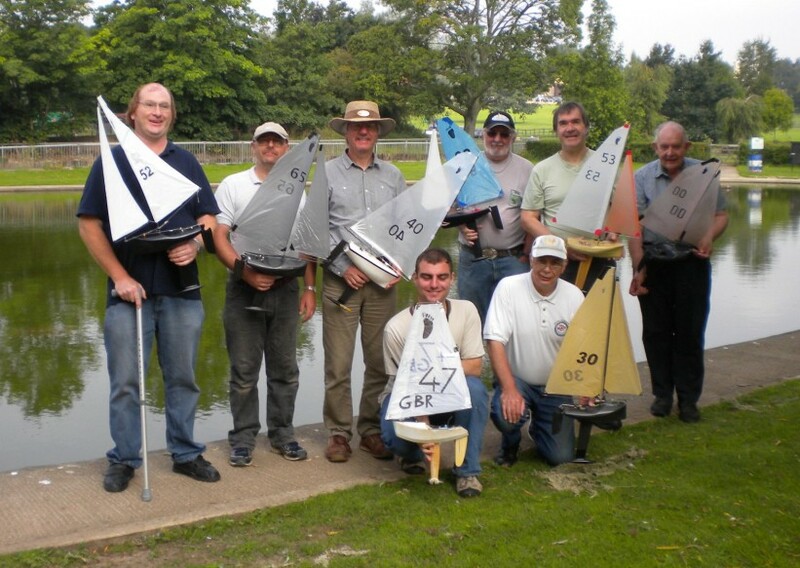 Nine skippers attended the event and we were pleased to have four visitors from other clubs to spice up the racing. All boats were checked in the box and the largest sails checked against the Stollery maximum sail template. The constantly shifting winds meant that if you fell behind you were always struggling to catch the others so a good start was essential. 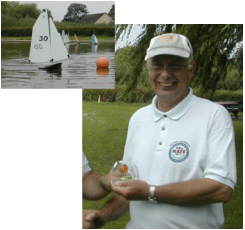 Peter sailed his ICE mainly using the A+ sail and his consistency was the key to his victory. 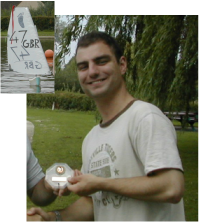 Scott Wallis was once again sailing his Depron Ranger and his finish was most creditable considering he was emptying water from it after most races. Other notable events during the day were Paul Risdale starting to pick up wins with his WICE, Peter Shepherd using an Una rig on his ICE from race six, Nigel Rudd improving performances throughout the day with a large number of 2nd places the first place just eluding him. Charles Smith bringing home his ICE victorious in race 8, a burnt out rudder servo for Graham Tite in race 5 put pay to his chances for the day, I am not sure he was to happy with the boat he borrowed to keep him sailing. Dave Lissaman finishing almost all the races instead of being given position on the water. I would like to thank Nigel & Gerard Rudd for all their help over the past few days to get the lake into a usable condition and all the competitors for making the event so enjoyable.